Homespun Stitchworks..... For the love of vintage: Winter Days ... stitching heaven. Winter Days! I simply love them. Lighting the fire and candles and sitting peacefully by the fire and stitching or reading. This time of the month we have the added beauty of Christmas sparkle all through our home and outside as well. The house smells of fresh Christmas trees and Winter spices! I have played hooky this week on the stitching front because I have had to write letters and post parcels this week for abroad, America, Canada, The Netherlands and Australia and it has been lovely to do. I have had my calligraphy pens out and lovely paper and gifts to wrap. I bought some wonderful Christmas sticker and had the sealing wax and stamp out as well. They are now all in the post system to arrive before the big day. Whilst all this was out I felt I should write my Christmas cards as well so it has been very productive and festive here at HQ. Although I simply adore this time of year I am looking forward to January when I can sit and just stitch. For two months it is quiet on the business front and deadlines are later in the year so it is time to design and stitch. To light the fire and just work away and looking out at the garden at the birds busy eating their breakfast and the frost covered garden when I am warm inside, makes me feel all cosy and content. and I wonder at every season and try and see the beauty in it. I will be taking photos later of my treasure that I truffled at The Dorset Christmas Brocante and then next week I can show you all. This weekend is my Birthday and so on Saturday we are going out for the day. It is a delayed celebration as we are off to London the following week, more about that next week. My sister and I have decorated Mums and she seems to like it although a little confused but it looks and smells of Christmas in her 'flatlet' and we are happy that she is festive. She is more happy with her fruit bowl of satsumas, sweets and tin of shortbread, however the little tree and the holly on pictures along with a robin with a plant in it pleases us because we have made it festive for her. Do you like my very old tin coach? 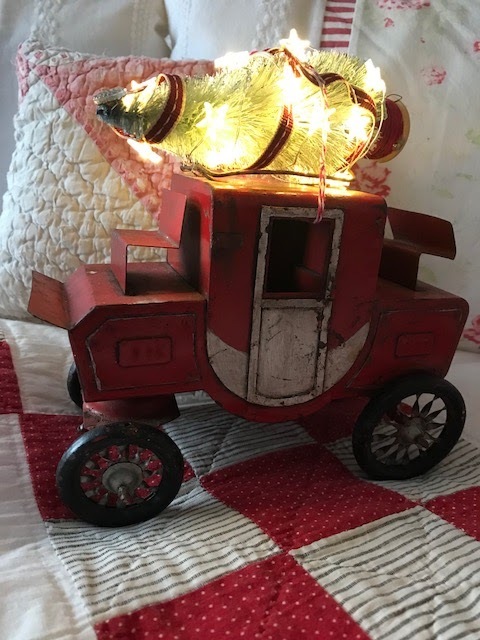 I wanted something different from the red truck/car with tree on top, so I found this treasure and added a bottle brush tree with ribbon and some star lights.. personally I am thrilled with the result. Our little mice have found a friend who is carol singing a lot, he is also looking after the little forest of reindeer food for Christmas Eve. I noticed today the mice are trying to find somewhere to leave their stockings for Santa ... When they decide on the position I will let you know. Still achy a little and I am fighting off something, the good thing is it is now upon the weekend and I can relax. We have put some champagne in the fridge and I can cuddle up by the fire and enjoy it. That is it for today and I hope that you all have a wonderful weekend. If you are out Christmas shopping enjoy it, take in the atmosphere and smile. It will be busy and there will be queues but it is festive and fun I always think. I will be wrapping up warm as I am permanently cold at the moment. Hope you are feeling better, and Happy Birthday.